It’s been two weeks since we went over variable consonants (refer back here to brush up if you want). You should be a little more familiar with the alphabet itself too, but here’s the chart below to help you out (and here’s the link back to the first hangul lesson catch up). I also inundated you with more information about differences between Korean/English substitution sounds. This isn’t for pronunciation yet, but we’ll be looking at how it affects the spelling of certain words. I’ll only put the most important/common ones. Alright so now that we’ve got the differences between syllables down, let’s look at a chart of all the varieties of Romanizations possible to get your brain in Korean mode. Don’t be overwhelmed; if you know the Korean alphabet, most of these are intuitive anyway and this chart is best used for cross-referencing/checking answers and spelling rather than memorization. In fact, I wholly recommend against trying to memorize it since it’s wasted space in your brain to do so. All you need to know is the Korean alphabet and you’ll have all of this naturally at your fingertips. Vowels on the left, Consonants on top. 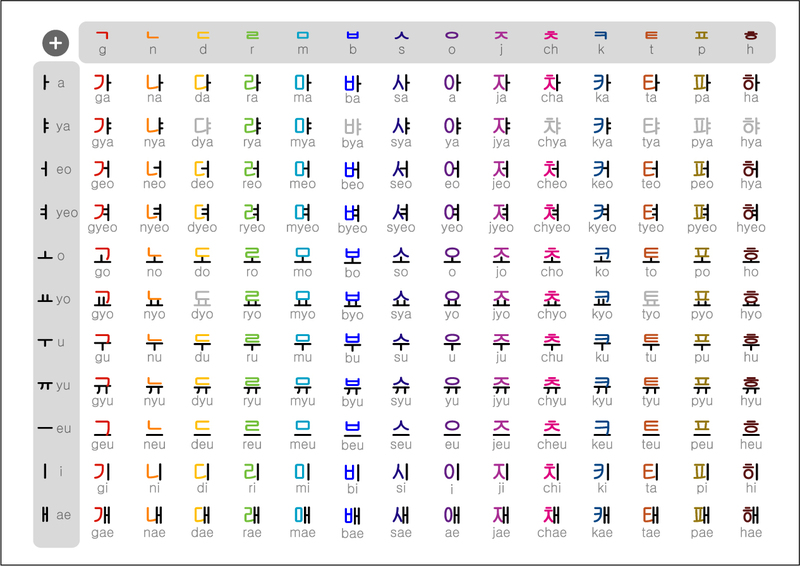 So now that we have the Korean alphabet and the Romanization chart, let’s try reading/writing some hangul. Sound it out and guess what that means. You know it, even if you think you don’t. …but it’s a fantastic way to practice the Korean alphabet in association with its phonetics. In both of these you’ll see these one and two syllable English expressions have been lengthened into three and five syllables in Korean. Both of them end on the “ㅡ” as well, which is almost without exception used as the sound linking awkward English consonant endings into more palatable words. 2. The second place you’ll see it come us is within words, specifically in consonant clusters such as “st”, or “br” or “cl”, etc. This is for the same reason as above, although making the additional mental note that it’s not only Korean words that very often end on vowel sounds, but many syllables as well. Sounds like “ㄹ”/”l”, “ㅁ”/”m”, “ㄴ”/”n” are usually exceptions to this rule, but most other consonants are swallowed at the end, or entirely silent. But this all sounds a lot more complicated than it is. In practice, it comes a lot more naturally than the theory behind it implies. So let’s practice with hangulized Konglish words adding extra syllables. Alright let’s end off there. You may also wonder, as I once did, why there are so many English words used when there have to be Korean words for them, like blueberry, or green tea, or kiss. The answer for this is that there definitely are Korean words for them, but it seems in vogue to use English words. What’s happening in Korean is what the French are terrified of happening to their language (hence language police in Quebec): English is being appropriated as slang. So that’s that! If you have any questions, as always, post them in the comments and I’ll be happy to give it a shot answering. I’ll leave you awesome hangul-learners off with one last hangul riddle, which I will give the answer to next week! What Do You Do On Thursdays?